wendy house » Blog Archive » whats on TV? A loud-mouthed moorhen* Coot was on TV in the River Kennet today. The bird had a lot to say. TV is a good medium for riding your message to the masses. This TV has a chameleon nature, colours matching the bird and the river. 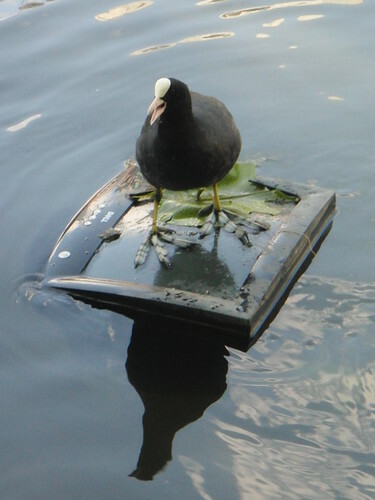 I suspect the moorhen Coot was announcing that this TV has beeen adopted as high-quality nesting material. This scribble was published on Sunday, June 12th, 2011. You can follow any banter on this scribble with the RSS 2.0 feed. You can share your inspired musings after typing the anti spam word near the bottom of the page. But no Pinging because its too naughty.